Times-Picayune SUNO investigation: Did a building kill four professors? 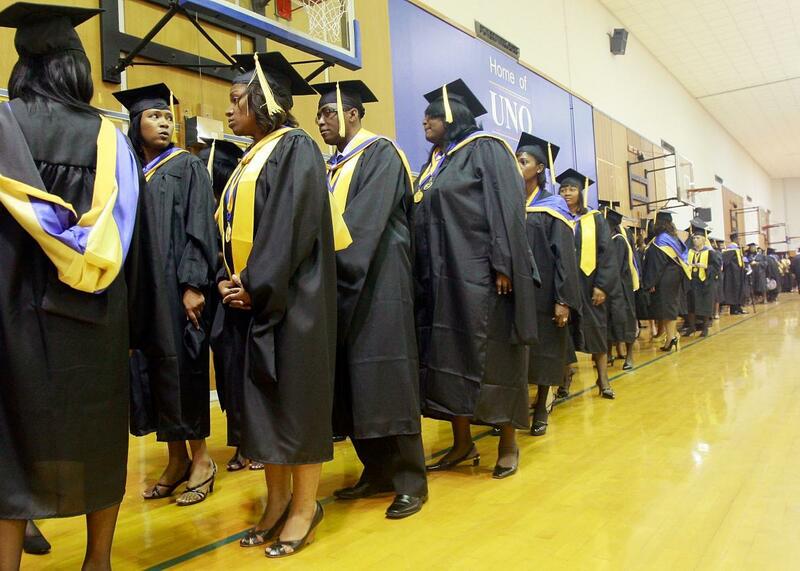 Southern University at New Orleans graduates line up for commencement in May 2009. At the intersection of class, race, university politics and the lingering damage of Hurricane Katrina lie the bodies of four professors from Southern University at New Orleans (SUNO), a historically African-American institution that primarily serves older, returning students. The professors died within three months of each other, and they all worked for years on the same floor of a building that leading environmental health experts have deemed uninhabitable. Now, thanks to a damning three-part investigation in the New Orleans Times-Picayune by reporter Jed Lipinski, folks are finally starting to wonder in public what many of the professors’ colleagues have been asking in private: Did the building kill them? When the levees broke in 2005, the SUNO campus was deluged with four and a half feet of water, causing $600 million in damage. By the time power was restored in 2008, the Multipurpose Building, where the four professors worked, had sustained extreme damage. After faculty moved back in, they lodged complaint after complaint with the administration of respiratory symptoms, nausea, and migraines. The mold Stachybotrys—which contains, as Lipinski writes, “potent toxins that, if inhaled, can adversely affect the central nervous system”—was present in 25 of 62 interior air samples taken by the firm responsible for the Multipurpose Building’s “successful” remediation. There is no empirical medical evidence (yet) that directly links any of the professors’ deaths with mold exposure: Sudipta Das, 60, and Marina Dumas-Haynes, 57, both had recurrences of breast cancer; Guillarne Leary, 72, died of a pulmonary embolism; Felix James, 76, died of heart disease. A skeptic might say that the deaths of 50-, 60- and 70-something professors with other health issues were simply a tragic coincidence. But the experts Lipinski consulted said the conditions in the Multipurpose Building may have exacerbated the illnesses that killed the professors. According to Tulane medical professor Maureen Lichtveld, they could have had compromised immune systems that drastically increased the chance of chronic infection. Individuals with prolonged exposure to dust and mold can develop chronic inflammatory response syndrome—which at least one reputable study found increased the chance of a breast cancer recurrence twofold, and another found carried a significant risk of lung clotting. Lipinski’s investigation also captures the domineering style of chancellor Victor Ukpolo and his administration and how the poor state of the job market in New Orleans—academic or otherwise—might have prevented faculty from taking other, safer work. Now, SUNO may close altogether. But the service SUNO’s faculty and staff perform to a traditionally underserved demographic—lower-income, older African-American students—is vitally important to the community. It would be tragedy compounded if the university were now driven into the ground.